Lucky paints her totem, the rainbow which comes to life during sun showers and after rain. 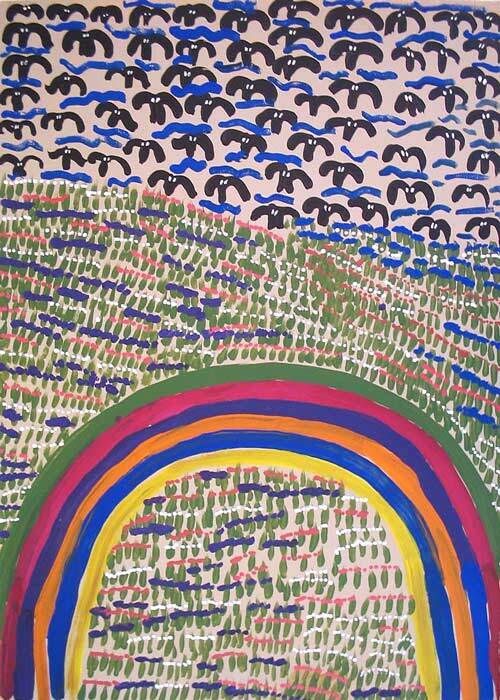 Rainbow Country (Dreaming) is associated with women's ceremonies ensuring the fertility of species bringing much needed water to the desert landscape. The rains bring the desert to life and encourages the bird life depicted in the background. Subjects Camp Scenes of Utopia life, Ilyarnayt Seed, Awelye (Women’s Ceremony), Dreamtime stories, Alpeyt (Wild Flowers), Rainbow Dreaming (Boor-la-da), Ilyarn,Tharrkarr,(Sweet Honey Grevillea), Yerramp (Honey Ant). 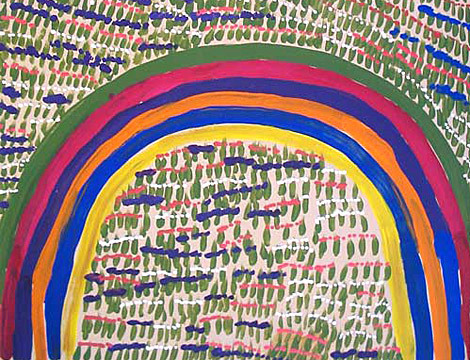 Lucky is the eldest daughter of Utopian artists, Mary Morton Kemarre and the late Billy Petyarre (c.1920-2007). Lucky has featured in many group exhibitions since beginning her artistic career. Lucky participated in batik workshops that were held in Utopia from 1977 to 1987, with her mother and younger siblings. Her work is represented in the Holmes a Court Collection, which was exhibited extensively in Australia and abroad. Like other batik artists living in Utopia, Lucky made the transition to painting in the summer of 1988-89 as part of CAAMA's The First works on Canvas, a Summer Project. With a more adaptable and immediate medium, Lucky continued to paint with acrylics and has travelled to Sydney and Melbourne for exhibitions featuring her work. Lucky has also worked with wood sculpture. Lucky attended a bush school near Hatcher's Creek, North East of Utopia and spent her childhood years growing up around Kurrajong Camp in Utopia and MacDonnell Downs Station. Lucky attended Batchelor Institute in Alice Springs and has travelled to Darwin and Tenant Creek for further education. Lucky plays an important role liaising with her community and health workers, assisting in the Health Clinic at Utopia. 2011	Finalist, 27th Telstra National Aboriginal and Torres Strait Islander Art Award, Museums and Art Galleries of the Northern Territory, Darwin, NT. 2008 - Power of Place, Paintings and Sculpture from the Eastern Desert, Tandanya: National Aboriginal Cultural Institute Inc., Adelaide. Brody, A., 1989, Utopia Women's Paintings: the First Works on Canvas, A Summer Project, 1988-89, Heytesbury Holdings, Perth. Brody, A., 1990, Utopia: a Picture Story, 88 Silk Batiks from the Robert Holmes a Court Collection, Heytesbury Holdings Ltd, Perth. 1990, Balance 1990: Views, Visions, Influences, Queensland Art Gallery, Brisbane.